This brand new show combines the grace and skills of acrobalance with state of the art technology to produce something both unique and magical. Their acrobats use their custom-made pixel costumes to disappear and then reappear in precarious balances, pass lights back and forth and battle to overcome the glitch that is creeping into their systems! 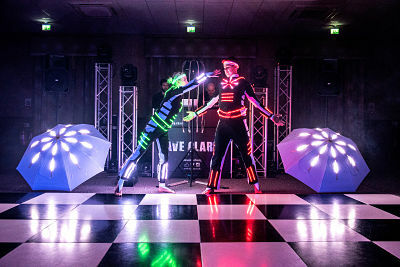 They are also able to mould this performance around you and your event with the ability to add logos/names and theming to suit your occasion at no extra cost! The 21st century is here! 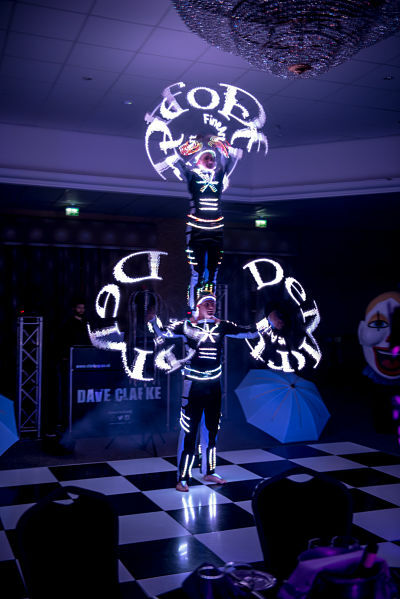 We have all seen glow in the dark, some flashing juggling props with led’s inside them, even the odd costume with fairy lights on it but the glow acro show takes it to another level! 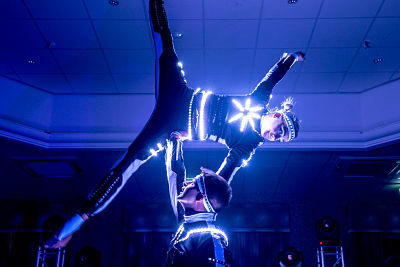 Looking like something out of a futuristic sci-fi movie, the highly skilled acro duo take to the stage and as they amaze us with their high level tricks, a carefully choreographed light show paints a parallel story using their bodies as the canvas. Somewhere in the shadows hides the technical genius who has set and programmed these unique light suits and he can operate the clever range of flashes, ripples and colour changes by remote… It really is a must see, when you watch this show, you will be watching the future! 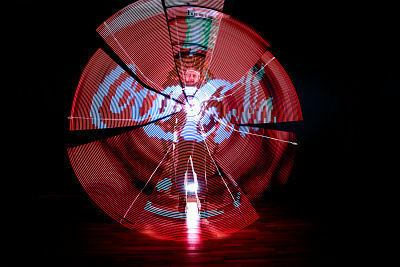 Happy client + impressed audiences + smooth production = Good job!